The study of trigonometry involves the measurement of triangles' sides and angles. 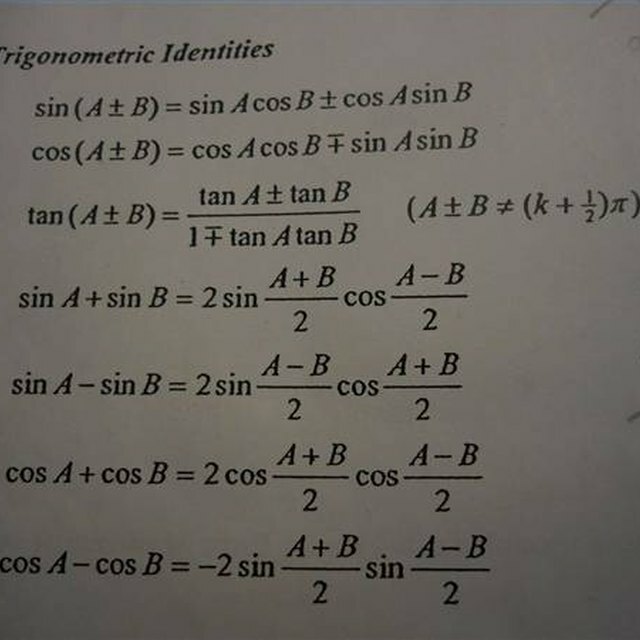 Trigonometry can be a challenging branch of math and is often taught on a similar level as pre-calculus or more advanced geometry. In trigonometry, you often have to calculate unknown dimensions of a triangle with little information. If you are given two sides of a triangle, you can use the Pythagorean Theorem, the sine/cosine/tangent ratios and the Law of Sines to calculate the angles. Input the values of the two known sides, or legs, of a right triangle into the Pythagorean Theorem equation: A^2 + B^2 = C^2. C is the hypotenuse, or the side opposite the right angle, according to the United States Naval Academy. Right angles are indicated by a small square in the corner. For example, a triangle with sides A and B lengths 3 and 4 would be 9 + 16, for a sum of 25. Subtract the square of the known side from the square of C. In a triangle with side A as 5 and the hypotenuse as 13, you would subtract 25 from 169, for a difference of 144. Take the square root of the difference to find the unknown side: The square root of 144 is 12, so side B has a length of 12. 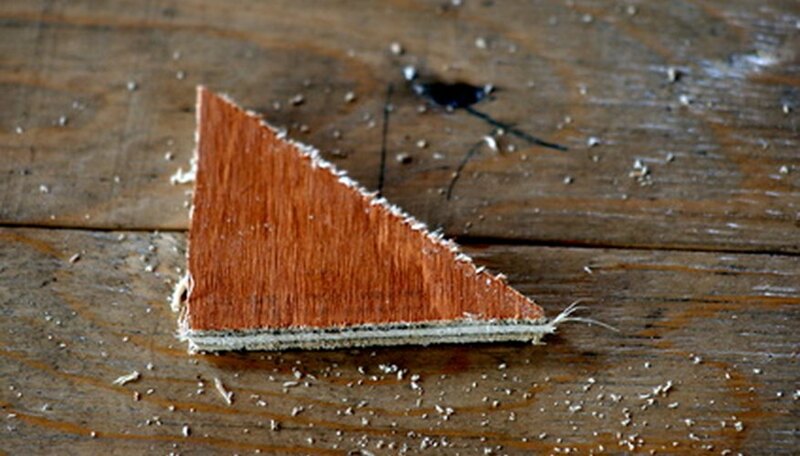 Pick one unknown angle in your triangle, formed by the hypotenuse and one of the legs. Calculate the sine of this angle by dividing the measurement of the opposite side by the measurement of the hypotenuse. For example using the angle formed by a hypotenuse of 13 and a leg of 5 requires you to divide the opposite side,12, by the hypotenuse,13, for a sine of 0.923. Calculate the cosine by dividing the adjacent leg by the hypotenuse. Using the previous triangle, you would divide 5 by 13, for a cosine of 0.384. On your calculator, input the value of either your sine or your cosine. Then press "inv." This should give you the angle associated with that value. The angle associated with sin 0.923 or cos 0.384 is 67.38 degrees. Add 90 to the angle you just calculated, and subtract the sum from 180. This will give you the third angle. For example, 67.38 + 90 = 154.38 degrees. The third angle is 25.62 degrees. If you have a triangle with no right angles, use the Law of Sines. According to Clark University, the Law of Sines is expressed in the equation sin(a)/A = sin(b)/B = sin(c)/C, where a represents an angle and A represents its opposite side. To calculate the value of the sine of an obtuse angle--an angle between 90 and 180 degrees--subtract it from 180 to derive the equivalent acute angle. Calculate the sine value for one angle by dividing opposite side by adjacent side. Find the quotient of sin(a)/A, and set it equal to x/B, where x is sin(b). Multiply both sides of the equation by B to solve for x.
Repeat to determine sin(c). Use your calculator to find the inverses of the sine values. O., Michael. "How to Calculate an Angle With Trig." Sciencing, https://sciencing.com/calculate-angle-trig-7156915.html. 24 April 2017.